There are certain situations where it can be tough to choose the right outfit. Going for a job interview is one of those. So today I will offer you some of my tips on how to get it right. First of all, it’s crucial that you make a good first impression. It is said that people make up their minds about you in the first seconds of seeing you and it is very difficult to change their minds after that. It’s a very interesting psychological phenomenon and you can read more about it here. You will never get a second chance to make a good first impression, so you better make sure that it is a good one! After giving your first impression, it is important that you stand out because of your capabilities, not so much for your outfit. So how to create an interview outfit that will leave a great first impression and does not get in the way of you getting the job? It is usually best if you can find an outfit that ‘blends in’ with the culture of the company, while at the same time letting your own personality shine through. So if you get a chance, get a feel of the dressing culture of the company whose job you are applying for. If this is not possible, then just stay on the safe side and dress reasonably conservative depending on the type of job you are applying for. Remember, conservative does not automatically mean black. In fact too much black should be avoided by women over 40, certainly close to your face. It could make you look too severe. If you don’t have a lot of information on the company’s culture, keep your outfit on the formal side. Any outfit becomes more formal and classy with a blazer jacket, so that is a good go-to piece for interviews. A flop proof combination is a white button down shirt, good quality straight leg pants and a stellar blazer in a neutral colour. Navy blue is always nice, but lighter neutrals work well too. Natural fabrics are best as they allow you to breathe through your clothes when questions get tough. Cool wool, silk or cotton are good but avoid fabrics that wrinkle too much like linen. Avoid showing too much skin or cleavage. Remember, you don’t want your outfit to distract from your capabilities. When it comes to choosing pants or a skirt I would stick as much as possible to your own preferences. Both can look equally good and it’s best to wear something that you are comfortable in. When choosing your colours, stay as true as possible to your personality but use colour in a subtle way. You don’t want your outfit to be distracting or overpowering. You can be a bit more adventurous for creative jobs as shown in the picture below. Make sure you are perfectly groomed. Nails should be manicured, haircut in good shape and makeup subtle. Stay away from too much (or any) perfume as this may irritate some people, but use your deodorant because you certainly don’t want any smells of the wrong kind! Any accessories that you wear should be subtle and of good quality. Wear a fabulous closed shoe of good quality and make sure they are freshly polished. Again I want to emphasise how important it is to understand the culture of a company. For example, if you are applying for a creative job, then showing up too conservative and formal may work against you. Make sure you show some creative flair with your outfit in that case and use colour. A good idea is to check what people wear by having a look at the office early in the morning when people come in. Another option is to check the website, which may show photos of employees and may give you a sense of the culture. 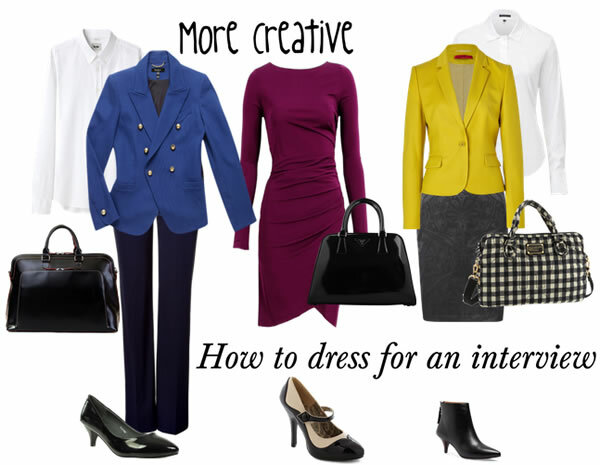 Below are some examples of what to wear in an interview for a creative job. More risky, but it gives you a chance to show some of your creativity and personality, which is very important for these kind of jobs. Did I cover all basics? What are your tips on what to wear to a job interview? I love that beautiful Hugo yellow jacket paired with the steel colored skirt and that amazing bag. Yes that outfit will certainly get you noticed! I think you covered it. I really like the shape of the blue jacket in the first set of examples, and the purple suit is a great color. Those 3/4 length sleeves would drive me bonkers, though! Those spectator Mary Janes in the second set of examples are so cute, and I like the checked bag and yellow jacket. The purple dress might be a little slinky for an interview, but with a jacket or cardigan over it I’m sure it would be fine. Nice selections! Yes I agree that normal length sleeves would have been better. The purple dress is certainly one of the riskier options, but for a creative editor job (or something like that) and if you have the confidence, it would be standout dress. two very strong points sylvia -and very true! creative jobs require creative/’eccentric’ outfits. perfect grooming (although i don’t agree 100% with suble colors) is really essential! loved the dress, the yellow jacket/grey skirt and the mary janes! Thanks Lena. I think subtle colours are mostly better for interviews, but once you get the job you should really get a lot more adventurous…. What a great post! Very good advice on a tricky subject. I go through the same quandary whenever I meet with a client. It’s not a formal job interview, but I feel what I wear is very important. The odd thing is I have very few clothes I feel are right for these situations! Most of my clothes are fun and casual, not the kind of quasi professional clothes I think are best. Yes, it’s always about making a great first impression. I usually keep it simple for client visits. Just some good pants or skirt and a button down skirt will usually do it. I think you have covered the subject well. I adore the purple dress, but because it goes up at the front, it would be too short for me. There were quite a lot of perfect items in this topic, but I am withstanding them. yes, you are right. Whenever you meet something new it’s about making a great first impression. That’s why it’s good to always try and look as best you can whenever you go out. You never know who you are going to meet! I am always baffled as to what to wear to an interview in the summer (especially in the South.) Any job I’ve ever had has been fairly casual, yet I err on the side of being slightly over-dressed as opposed to under-dressed. However, I think it looks ridiculous to wear a blazer or suit when it’s 95 and humid out. Any suggestions there? I would go for a good quality button down shirt that is not see through (or wear with singlet underneath). You can opt for something with a slight stripe or pattern, or for a solid colour. When going for a plain colour, you may even dress it up with a silk scarf. Hi Sylvia, your comments have been very helpful. I’m interested in the very first outfit up above (plum jacket & purse, black pants, white blouse) where can I purchase it? I don’t see any of the pieces in your featured looks section. Thanks! Hi Cherise, I’m afraid this is an older article so none of these items are available anymore. Good luck with finding similar items! Darn! Thanks for the quick response. Would you happen to remember where you originally found it? Maybe they will have similar style. You can never go wrong with good fitting pants, a shirt and a blazer (blazer is optional). You can dress this look up or down and it still looks professional. Blue pants with a striped shirt would look well. Add a few accessories for an overall polished look. Yes, I think you pretty well covered it all. However, I would like to add that your outfit looks like you’ve always worn it (not brand new for the interview). Goes for the shoes too. You don’t want want to give the impression that you’re just starting to work. You’ve been around a while and know what you’re doing. A hair cut is also a good idea but not the day before or day off. I would also recommend that a professional sturdy looking attache case or purse looks business like. No jingly jangly jewellry. I hate interviews in the winter when you have to deal with coats, hats, gloves and boots (having to take them off and on – seems like part of the interview because they are watching you. Yuck!) The rain is even worse. Also, a good idea to have 2 main outfits in case you have 2 interviews. I hate interviews and have 2 much experience with interviews, ha! ha! Next post: The 40+ Community is growing strong!